JOHNSTOWN, PA, May 24, 2016—One of the many services that Goodwill of the Southern Alleghenies provides for job seekers with barriers to employment is On-the-Job Training (OJT). OJT helps to offset employers’ initial training costs to fill skilled positions while job seekers learn the requirements of the job. A remarkable match of employer and employee resulted in recognition with Governor’s awards at the Pennsylvania Workforce Development Association’s 32nd Annual Employment, Training & Education Conference last week in Hershey. Goodwill, which holds the Title I Contract for the U.S. Department of Labor-funded Workforce Innovation and Opportunity Act (WIOA), made possible through the Southern Alleghenies Workforce Development Board (SAWDB), provides comprehensive job training and employment services at the Pennsylvania CareerLink Cambria County located at 445 Schoolhouse Road, Johnstown. Goodwill’s Career Planners and Business Services Staff at the CareerLink provide these services. The following story is the actual Nomination Narrative for the 2016 Governor’s Achievement Awards/Governor’s Job Creation Awards written by Goodwill’s Business Services Coordinator and Certified Workforce Development Professional, Renee Shaw, M.Ed. and submitted by SAWDB. But that’s the ending to the story. The story begins with a young man, required to do community service as part of his parole for a drug violation, living in a half-way house, having no work, no transportation, no credibility, and wanting to help the community, but not knowing how. One day he came into the Johnstown Free Medical Clinic to volunteer to help move furniture. Executive Director, Rosalie Danchanko, met an energetic, intelligent, well mannered young man who needed mentoring and a purpose. He was very shy and very smart. So when he asked her what else he could do to help out, she asked him if he knew anything about filing — resulting in his filing over 700 patient files. It was his outstanding organizational skills that led to creating, and in-putting, all 700 of those files into a new database. Over the next several weeks, he volunteered a few more times for her. His stay at the half-way house was almost over, and he was looking for a job. Rosalie, an active member of Goodwill of the Southern Alleghenies’s business advisory council was looking for a way to assist him with a job, so she took him to the PA CareerLink Cambria County, which was one of the provisions of his release. After meeting with his Career Planner and being assessed as On-the-Job Training (OJT) eligible, he was sent for an interview at the Johnstown Free Medical Clinic and was hired. His training plan was developed as a Data Entry Coordinator, and was amended to include Medical Records Technology training. His OJT (960 hours/6months) provided both the personal mentoring and the professional training skills that helped him excel. His leadership capabilities, his representation of the Johnstown Free Medical Clinic at public venues, his involvement in community outreach at schools talking to students about his past drug abuse, and his career advancement have resulted in his promotion to Executive Administrative Assistant at the clinic. Rosalie worked with him, instilling knowledge, pride and confidence by mentoring him, advocated for him with other agencies, and has kept him engaged in a new purpose. She exceeded her commitment to his training by setting the goal to mainstream him into the workforce system. He made great progress. He represents the clinic, attending local job fairs to speak and recruit volunteers for the clinic. He is currently preparing to enroll in college. He is drug-free and living independently and has purchased his own vehicle. He now has a future with a sustainable wage. The Johnstown Free Medical Clinic provides additional opportunities for on-the-job training and internships for nursing students and various medical personnel. They have had five new hires over the past year. Rosalie and the Johnstown Free Medical Clinic continue their commitment to workforce development and plan to expand clinic services and hires in additional counties. The young man described above is Felipe Lucio, Jr. 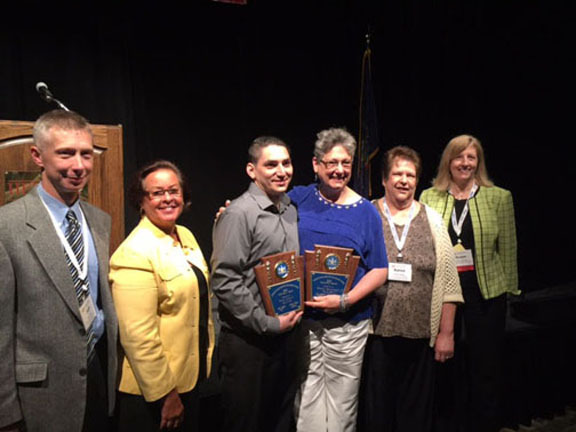 In April 2016, the Secretary of The Pennsylvania Department of Corrections (PADOC) in collaboration with the Chairman of the Pennsylvania Commission on Crime and Delinquency (PCCD) sent Rosalie a letter to inform and congratulate her for being selected to receive the Second Annual Governor’s Criminal Justice Employer Award, inviting her and Felipe to be recognized at the Pennsylvania Workforce Development Association’s 32nd Annual Employment, Training & Education Conference in Hershey on May 19. 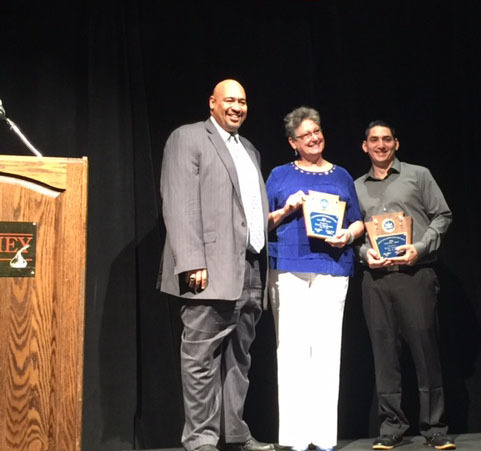 Felipe was presented with the 2016 Governor’s Criminal Justice Achievement Award. For information on Goodwill’s Workforce Development Services, contact Ann Torledsky, V.P. of Workforce Development at (814) 536-3536, ext. 230 or atorled@goodwilljohnstown.org.